Chris Lowry has spent most of his life improving his art. Functional glass with a strong aesthetic appeal, his work has been described as “natural” and “captivating.” Chris states, “My work has a strong personality. A piece should grab your attention and then be able to keep it.” Growing up in his father’s glass shop in Oregon, Chris became serious about his art at age 18 when he moved to Oahu. Working as an assistant teacher to glassblower Hugh Jenkins, Chris found himself with the freedom to explore the different possibilities glass had to offer. Chris’ move to Maui and a job at Hot Island Glass, taught him the importance of marketability. Chris earned a Bachelor’s Degree of Fine Arts with emphasis on Blown Glass/Steel Sculpture. He took top awards upon graduation. Throughout his career, Chris has made it a point to learn from other glassblowers and has studied under master Pino Signoretto at Pilchuck Glass School and teachers at Penland School of Arts and Crafts. In May of 2000, Chris and his friend Chris Richards bought Hot Island Glass. His handblown pieces are characterized by their classical forms with rich, vibrant colors in unexpected combinations. Chris grew up in Washington, just outside Seattle. His first exposure to glassblowing was as a child, when he took frequent trips to his aunt and uncles glass studio and gallery in oregon. In his words, “Blowing glass is not something I set out to do, it’s something that just happened…once I tried it, I was hooked”. 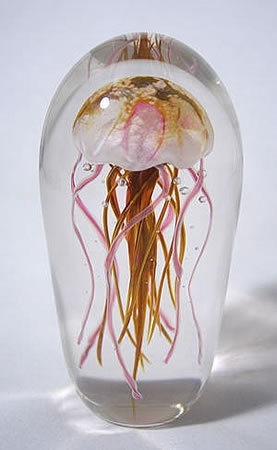 Maui GlassMasters Chris Lowry & Christopher Richards tropical free floating jellyfish sculpture. Captivating and alluring, words that describe this marvelous creation. Two sizes, small, approx. 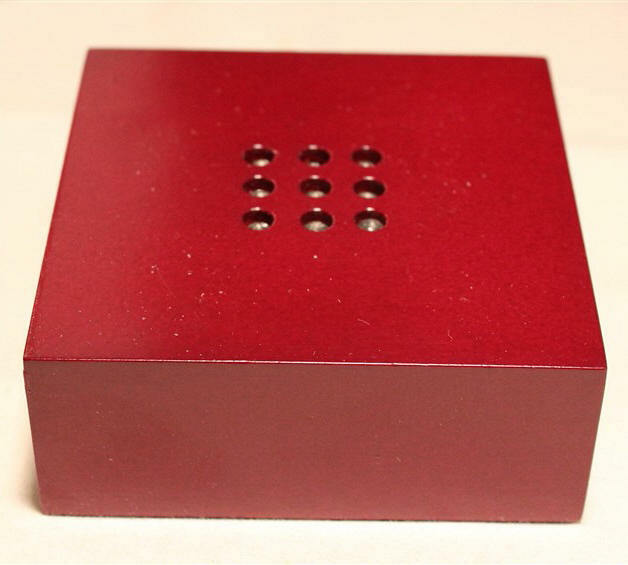 6.50"h x 3.30" diameter. Large, approx. 9.0" h. Signed Hot Island Glass & dated, Maui. 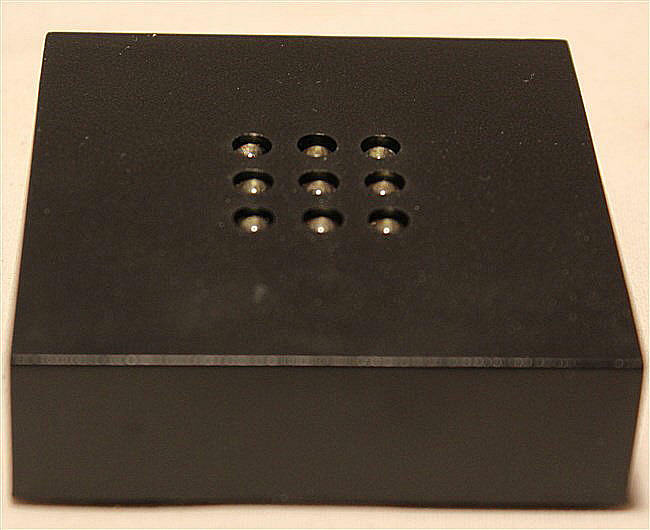 Order a light kit to bring out the fine detail and enhance the color. 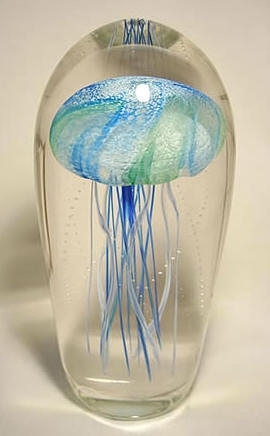 Maui GlassMasters Chris Lowry & Christopher Richards free floating jellyfish sculpture encased in glass. Hand blown exclusively by the artists, and not apprentices. Captivating and alluring, words that describe this marvelous creation. Approximately 9.0" x 4.5" dia. and 9.0 lbs. Maui GlassMasters, Chris Lowry & Christopher Richards free floating jellyfish sculpture. Captivating, alluring, fasinating, words that describe this marvelous creation.Done in pink/purple approximately 6.75" h x 3.75" diameter. Signed Hot Island Glass & dated, Maui. 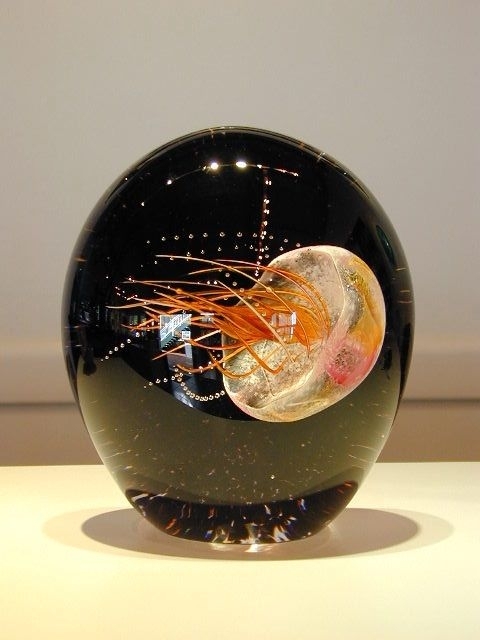 Chris Lowry & Christopher Richards glass encased jellyfish sculpture. Viewing this delicate sea form is relaxing and bestows a sense of calmness. Done in it's natural colors pink/purple, approximately 7.50" x 3.50" dia. and quite substantial. Signed Hot Island Glass & dated, Maui. Add a light kit to bring out the detail. 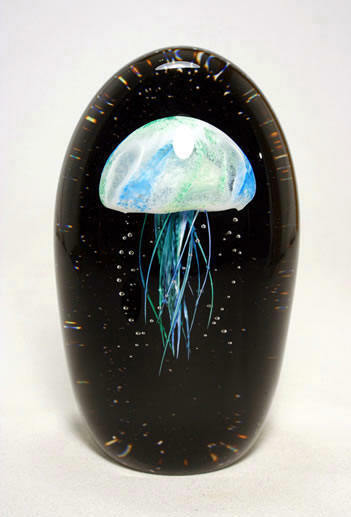 Maui GlassMasters Chris Lowry & Christopher Richards midnight jelly, a tropical free floating jellyfish sculpture. Captivating and alluring, words that describe this marvelous creation. 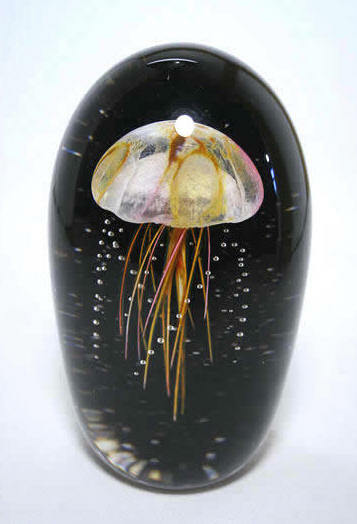 Done in amber and cream and is approximately 5.0"h x 4.0" x 2.25"d.
Maui GlassMasters, Chris Lowry & Christopher Richards midnight jellyfish sculpture. Exclusive design, exquisite natural colors, breathtaking, describe this marvelous sea life creation. Done in blue/green approximately 5.5"h x 3.35"w x 2.40"d. Signed Hot Island Glass Maui and dated. 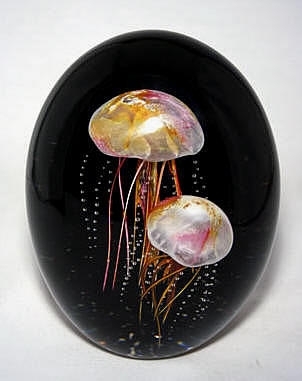 Maui GlassMasters Chris Lowry & Christopher Richards sideways midnight jellyfish with a creamy top & peachy color tentacles. Hand blown and encased in clear glass. Approx. 5.50 h" x 4.25 "w x 2.80 "d. Signed Hot Island Glass Maui and dated. 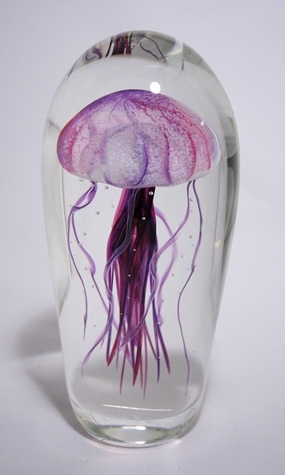 Maui GlassMasters Chris Lowry & Christopher Richards free floating, sideways midnight jellyfish sculpture in pink/purple. 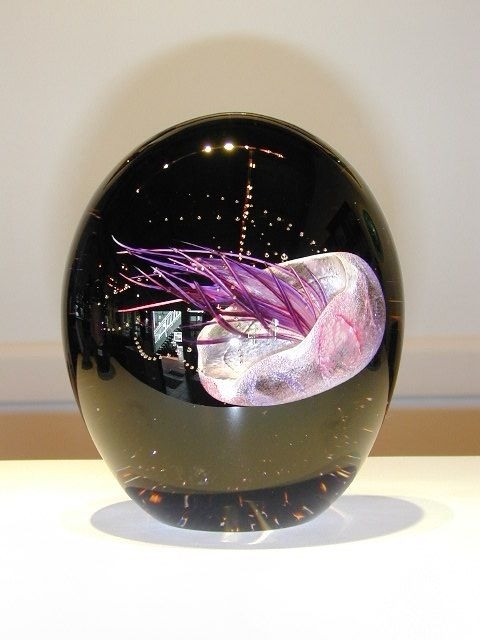 Hand blown exclusively by the artists, not apprentices and encased in clear glass. Captivating, alluring, fascinating, words that describe this marvelous creation. Viewing this colorful jellyfish brings a sence of serenity, like that of watching fish in an aquarium. It is done in this creatures natural colors, which gives it a true life like appearance. Approximately 5.75'"h x 4.40"w x 2.70"d. Artist signed and dated.